Access to health care gained the spotlight on national and international development agendas when the 1978 Alma Ata Declaration outlined a strategy for achieving universal access to primary health care by the year 2000 (World Health Organization, 1978). The Millennium Development Goals (MDGs) set targets for improving health-care delivery by 2015, and the United Nations’ new Sustainable Development Goals (SDGs), which took effect in January 2016, extend and supplement those with ambitious targets aimed at ensuring healthy lives for all. 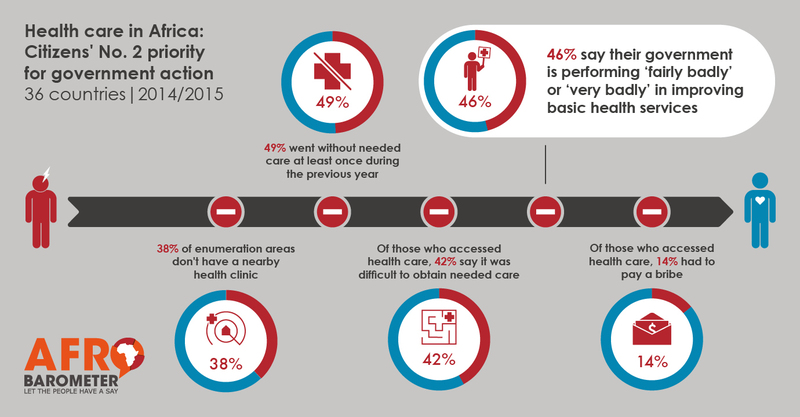 Despite significant gains under these initiatives, Africans fully support health care’s continued prominence on development agendas: In Afrobarometer surveys across 36 African countries in 2014/2015, citizens rank health as the second-most-important problem (after unemployment) that their governments need to address, as well as the No. 2 priority (after education) requiring additional government investment.